The Case for Non-U.S. Small-Cap Equities - Epoch Investment Partners, Inc. In the beginning, asset allocation was primarily seen as a choice between stocks and bonds. By stocks, people generally meant U.S. large-cap blue-chip companies. Increasing sophistication and awareness about the benefits of diversification has gradually expanded the menu of equity investment choices that are represented in modern institutional portfolios. This progression in the equity space from U.S. large cap to U.S. small cap, Non-U.S. large cap, and now increasingly non-U.S. small cap can be seen as another of the many benefits of globalization. The increased liquidity and transparency of financial markets around the world has made raising capital on a global scale not only possible, but commonplace — even for the smallest of companies. So, the question arises, can a case be made for maintaining an allocation to non-U.S. small caps? At Epoch Investment Partners, we believe there are many compelling reasons, both from a beta and an alpha perspective, that make non-U.S. small-cap equities attractive in normal as well as abnormal market environments. The persistently large fiscal deficit and immense mountain of debt that confront the U.S. economy, naturally gives rise to worries about the strength of the U.S. dollar. Figure 1 shows that there is a persistent inverse relationship between the relative returns of non-U.S. small-cap stocks with the other segments of the global equity market and a broad trade-weighted U.S. dollar index. As the dollar index line falls, representing a weakening U.S. dollar, the relative return lines have a tendency to increase, signifying the relative outperformance of non-U.S. small cap versus the other sections of the global equity market. The chart implies that non-U.S. small-cap stocks are a better hedge against a declining U.S. dollar. This is particularly important for U.S. investors who wish to maintain their global purchasing power in the face of a weakening domestic currency. Small cap companies by their very nature are generally focused on selling products and services into the markets where they are domiciled. This is one of the classic diversifying benefits of a non-U.S. small-cap allocation from the perspective of a U.S. investor. Today, however, non-U.S. small-cap companies are increasingly selling globally, taking advantage of the rising tide of global trade. Think of the German Mittelstand1 companies that, although relatively small, have attained market leading positions in many global niches. Compared to U.S. small-cap companies, non-U.S. small-cap companies have on average 50% more non-domestic revenue exposure: 30% of sales are sourced outside their home country compared to 20% for U.S. small-cap firms. Although correlations have remained high in the post-crisis period, providing less of a diversification benefit in portfolio construction, the Sharpe ratio (which is a measure of return per unit of risk) of non-U.S. small-cap equities has been comparable to large-cap equities. Figure 2 shows the rolling 60-month Sharpe ratios for the MSCI World ex USA and MSCI USA large and small indices. In these days of lowered return expectations, the increased risk of non-U.S. small-cap equities is compensated for with proportionally higher returns. In environments with relatively low volatility and abundant liquidity, non-U.S. small-cap stocks have outperformed large-cap stocks. Figure 3 shows the drawdown, or percentage below its all-time high, and the subsequent one-year absolute and relative (to a global large-cap universe) returns for non-U.S. small-cap stocks in the period that followed the previous financial crisis. The absolute and relative returns for non-U.S. stocks were high and fairly stable in a period that was characterized by declining levels of financial stress. Figure 4 plots a measure of financial stress from the Federal Reserve Bank of St. Louis against the relative returns of non-U.S. small cap versus the other segments of the equity market. When financial stress is decreasing non-U.S. small caps outperform. The rebound from the current financial crisis is shown in Figure 5. Non-U.S. small cap has recovered from this latest crisis in much the same way it did in the aftermath of the previous one. Alpha, or separating the wheat from the chafe, is the raison d’être for active management. There are many reasons to think that the opportunities for alpha are much greater in the non-U.S. small-cap space than in any of the other sections of the global equity market. For starters, non-U.S. small-cap companies have markedly less analyst coverage than other sections of the market. Figure 6 shows the average and median number of sell-side analysts covering the typical company in each of the four segments of the global equity market along with the percentage of stocks in each segment that are uncovered by any analyst. Less coverage creates more opportunity to find undervalued and unappreciated stocks. There is also a higher dispersion of returns within non-U.S. small-cap stocks than in the other segments. Figure 7 shows the spread between quartiles for U.S. and non-U.S. large- and small-cap stocks. This gives an indication of the benefits that are available from discriminating between winners and losers in each segment. A larger spread implies greater opportunities for skilled active managers to generate alpha. Finally, the nature of small-cap stocks provides more focused exposure to individual themes, regions, or business models. Non-U.S. small cap helps investors expand their opportunity set by targeting niche exposure to local economies and industries. For example, if you believed there would be greater than expected advertising growth in Germany, the only large cap plays would be WPP, Interpublic, and Publicis, each of which has less than 10% of their sales in Germany. By contrast, in the small-cap space, one can invest in Proseiben (free to air broadcaster), Axel Springer (German newspapers), and Stoeer (German outdoor advertising), all of which have more than 70% of their sales in Germany. The unprecedented interconnectedness of markets — spurred on by the realization that all asset classes are now bound together by global financial intermediaries and that in times of crisis, liquidity is the most important risk factor — has caused the correlations of non-U.S. small-cap equities with the other partitions of the global equity market to remain elevated. Figure 8 plots the rolling 60-month correlations of non-U.S. small cap with the other sections of the global equity market. The jump in correlations, especially with U.S. stock indices, has been pronounced in the aftermath of the global financial crisis of 2007-2009. Despite this rise, we anticipate that as the world gradually normalizes, correlations will decline to their historical levels, providing increased diversification benefits. 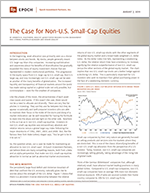 Although the current valuation of non-U.S. small-cap stocks in both absolute (Figure 9) and relative (Figure 10) terms is not particularly expensive compared to their history, they are no longer extraordinarily cheap when compared to U.S. large and small-cap or non-U.S. large-cap equities. Our current recommendation is in line with the historical relative valuation in maintaining a neutral stance with regard to a strategic policy allocation. Mark Twain said that while history doesn’t repeat itself, it does rhyme. Only in hindsight do we truly see the opportunities that were laid before us. It is clear now that late 2008 presented just such an opportunity for non-U.S. small-cap equities. Today, although the case for non-U.S. small cap is less compelling, there are many reasons from both a beta and an alpha perspective to maintain or increase a strategic policy allocation toward the asset class. It is very difficult to disentangle alpha from beta, especially in one-way markets. You need many observations to make statistically significant tests of luck versus skill. The past several years have seen volatile markets with several up and down moves that should help to uncover those investment managers who can provide performance in a variety of markets — in a word, alpha. It is important to remember that volatile markets present opportunities as well as risks. Thus, longer-term track records are as important today as they ever have been, subject to the well known caveats of past performance predicting future results.